Experience elite PC gaming on a notebook with the GeForce® GTX 980M and 970M. Powered by the incredibly advanced, next-generation NVIDIA Maxwell™ architecture, they deliver unrivaled performance, innovative graphics technologies, and long battery life for extended gameplay. 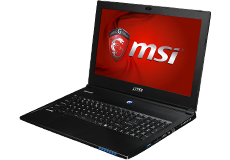 The GeForce GTX 900M introduces a new breed of advanced notebooks. From sleek, super-portable form factors to heavyweight powerhouses, they all come loaded with the latest GTX gaming features, including VXGI for realistic lighting, DSR for 4K image fidelity, and MFAA for hyper-realistic gaming. Even challenging games like Far Cry 4, Assassin’s Creed: Unity, and The Crew come alive with twice the performance of previous-generation GPUs*. NVIDIA BatteryBoost™ technology leverages the incredible power efficiency of the Maxwell architecture to extend gameplay sessions to nearly 2 hours on a single charge. NVIDIA GameStream™ also lets you take full advantage of notebook portability by streaming PC games anywhere you go. NVIDIA ShadowPlay™ even lets you capture, share, and publish gameplay in real time. * GeForce GTX 680 and 670.